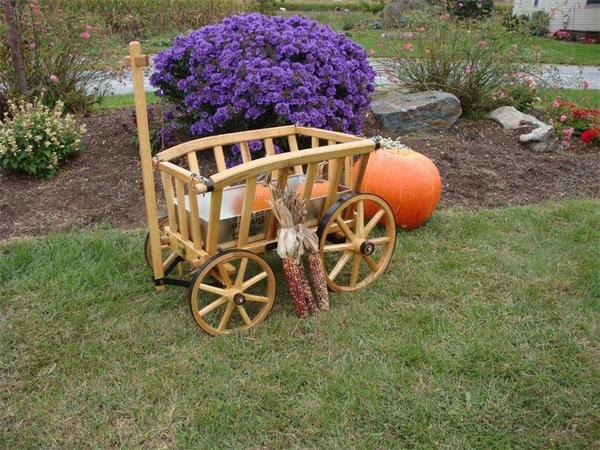 Handcrafted by expert Amish woodworkers right here in the USA, this solid wood goat cart is as versatile as it is good-looking. Use its ample space for seasonal displays ranging from Easter decorations to Thanksgiving pumpkins. This wagon is ultra-durable Amish construction with steam-bent fittings to haul everything you need to be transported in the yard from firewood to your harvested corn. This particular wagon is crafted in our rustic style where the wood is left in its natural state not sanded and then placed outside to naturally weather. You can order the wood with no stain or you can choose from our many finish options.